Always try and find more than one estimate for your flower needs and that any estimates are firm and would include all set up or delivery charges. Be sure in your discussions that each communication is clearly understood and that you know what services and designs the florist will be providing at your wedding. Also, discuss the event of substitution and what choices would be acceptable to you, in case this happens. will assist the florist in creating your exact bouquet or in reflecting your perfect wedding theme. It is a bit difficult to match dress colors with florist ribbons by name. If you could find samples of dress colors that match, this will greatly assist the florist in their ribbon selections. Make your flower choices based on the season that your wedding will be held in. An example of this is that choosing spring flowers in the fall or summer could result in higher prices as spring varieties are often imported at that time of year and do not hold up as well in warmer weather. It is the florists job to assist in selecting flowers that will be reasonable in cost, available in the colors and varieties you need and that will hold up and look great in photos. If you select flowers that are available locally or that are in season your costs will be lower and your wedding much more full and beautiful. The florist should be able to suggest several floral combination's in both Classic styles and Contemporary that will create the look and feel you are seeking or could help you develop any ideas you may have. 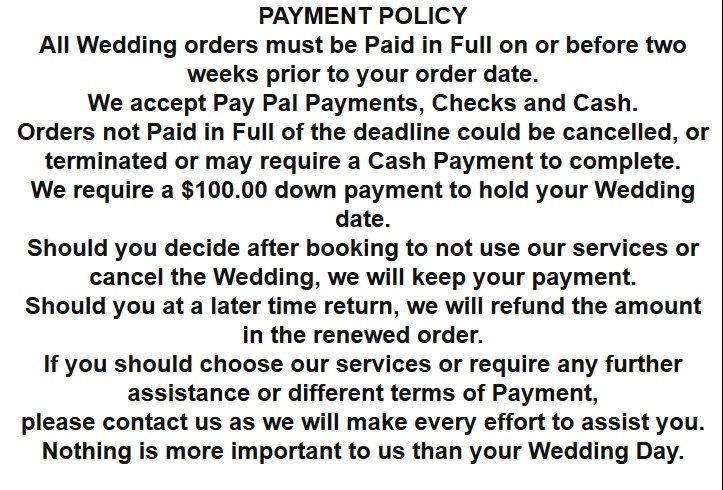 Providing a payment for Wedding Flowers and our services? Cash, Checks or using our Pay Pal link, most credit and debit cards. Cash - Please contact us through our information below to arrange payment. Check - Make payable to John Mays - send to our PO Box. Below is the link that will take you to "Pay Pal" our Card processor. Safe, Secure, easy to use no "Pay Pal" account required. Just click the "Buy Now" button. We will send you a receipt immediately upon notification of a payment.